The paper presents analysis of industrial gas turbine and its upgrade with heat regenerator. Based on a gas turbine operational data from a thermal power plant (base process) it was investigated advantages and disadvantages of heat regenerator implementation in the gas turbine process. Regenerator efficiencies were varied between 75% and 95%. Heat regenerator causes decrease of gas turbine fuel consumption up to 0.621 kg/s with a simultaneous increase in gas turbine process efficiency up to 10.52%. The main disadvantages of heat regenerator implementation are decrease in turbine cumulative and useful power along with decrease in the cumulative amount of heat released from the process. The article explores contemporary computer tools for design of reduction gear. 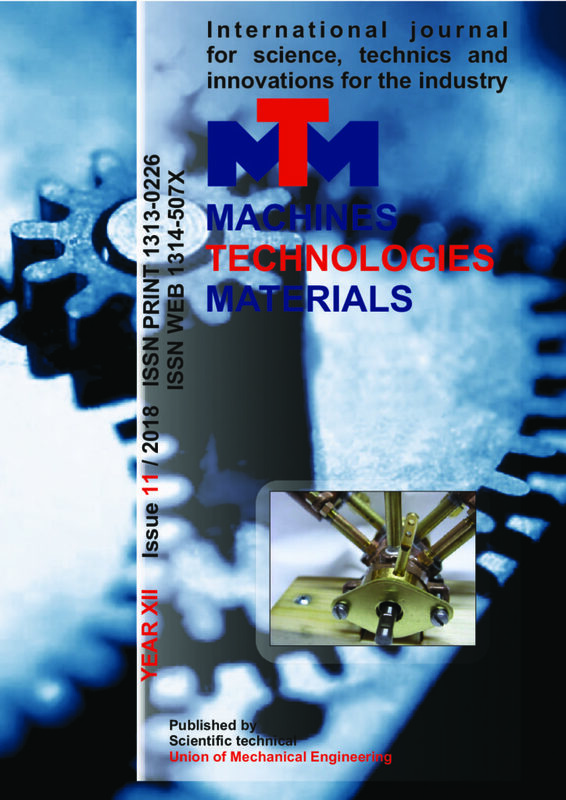 The article is fully adapted to the need for knowledge and skills in the future work of engineers in mashine engineering. This scientific paper presents the research conducted for defining the characteristics of the conformal cooling systems used in molds for injection molding processes (IMP). By utilizing laser-sintering additive manufacturing (AM) technologies, this type of cooling systems could be used to minimize the cooling and cycle times in the IMP’s and provide a homogeneous cooling necessary to maintain a consistent quality of the part. The paper also presents an overview of the AM technologies used in manufacturing conformal cooling molds and the main guidelines for designing these cooling systems. The research shows that the efficiency of these channels is based on the channel system’s design; and for plastic parts with a lower complexity the improved temperature distribution compared to conventional cooling systems could be negligent. The research is conducted by using Finite Element Analysis (FEA) and CAD modeling to compare different conformal shapes, as well as their cooling efficiency on a plastic part. The simulation studies are done to determine the temperature distribution in each case study. These trials are done to assess the productivity benefits that arise from the use of conformal cooling channels compared to conventional channels that utilize baffles and bubblers. Production systems with elements of intellectual technologies can be found in various fields of production. To ensure the effectiveness of such systems, digital technologies are often used, which allow to create special databases for describing their state in functioning and to analyze data for identifying sources that lead to loss of efficiency. This article focuses on the construction of digital models for analyzing the production system of packaging, taken as an example. It is shown how data analysis is performed to identify critical elements in the production system. Efficient use of energy means meeting the necessary needs, without compromising the level of comfort and safety, effectively using energy resources that achieve a direct saving of resources and money. Effective use of energy has a direct impact on reducing energy costs in enterprises, thus increasing their competitiveness. The purpose of this report is to investigate the opportunities for energy efficiency improvement and evaluation of energy projects in industrial enterprises. The results show an increase in the production of RES from all types of power plants except HPP. Nevertheless, hydropower retains the largest share in the structure of RES production. At the same time, there is a decrease in the average cost to society of all types of RES, except for biomass. Europe faces a number of energy problems including: increasing dependence on imports, insufficient diversification, high and volatile energy prices, rising global energy demand, security risks affecting producer and transit states, increasing threats climate change, slow progress in the area of energy efficiency, challenges related to the use of an increasing share of renewable energy sources, and need of greater transparency, further integration and interconnection of energy markets. The paper deals with the problems in the operation of non-linear loads, causing distortions in the sinewaves of voltages and currents. There is currently increasing use of variable frequency drives (frequency inverters) that drive electric motors and are such loads. The experimental results cover multiple measurements of voltages and currents harmonic components and the calculated values of the total harmonic distortion coefficients of voltage and current for each of the phases, supplying different loads. An analysis of the results obtained has been done and specific conclusions have been pointed out on the basis of the measurements carried out. Peculiarities of stress-strain state of pressure hull of underwater technical device, shaped as torus with circle intersection, which was obtained by spiral winding of polymer composite materials, are presented. X-Rays diffraction method were used to determine the residual stresses and local phase composition through the thickness of as-sprayed by flame-sprayed thermal barrier coatings consisting of a NiAl bond coat and composite ceramic coatings (Al2O3 –22wt% ZrSiO4) topcoat produced. The as-sprayed residual stresses reflected the combined influence of quenching stresses from the flame spray process, thermal expansion mismatch between the topcoat, bond coat and substrate, and stress relief from the segmentation cracks. The thickness of bond coating was (150ϻm) and for composite ceramic coating was (450 ϻm). The residual stresses evaluated by X-Ray diffraction technique were maximum tensile residual stresses (15.626) Mpa. It is investigated features of phase structure of metal-polymeric nanocomposite based on thermoplastic matrices. Effect of realization of reversible phase transition “nanometal – high-molecular metal-containing compound” which determines hardening, wear and thermal-oxidative degradation mechanisms is established. The physical properties of nanoparticles as modifiers are depend on their geometrical characteristics. These objects have 5- and 10-axis symmetry which is forbidden for crystals. The 3×3 matrices-generators of point groups of rotation in crystallographical and crystallophysics basises have as matrix elements 0 and ±1, except groups hexa- and trigonal in H-basis crystals. But these lattices too have 0 and ±1 as matrix elements for matrical representation of point moving in crystallographical basis. For describing the point groups of pentagonal and decagonal symmetries, instead of crystal lattices the so-named general regular lattices (GRL). The two dimensional GRL is known as Penrose’s sets. For 3-d pentagonal sets there are 14 groups of point symmetry, which are not crystallographic because their elements may be golden ratio.